The Birmingham-Jefferson Convention Complex (BJCC) is Alabama’s largest convention address, with meeting facilities all on one campus. The BJCC complex campus has 350,000 square feet of convention and exhibition space. The complex includes an 18,000-seat arena and 4,000 seats in two theaters. Two hotels, The Sheraton Birmingham Hotel and Westin Birmingham, are also part of the complex. The complex also includes Uptown entertainment district and Topgolf. Throughout 2019, work will be done to improve and replace the elevated portions of the I-59/20 bridges that run through downtown Birmingham. In order to complete this transformational project, which is known as the I-59/20 Central Business District Interchange and Bridge Replacement Project, we will experience bridge and road closures throughout the area. 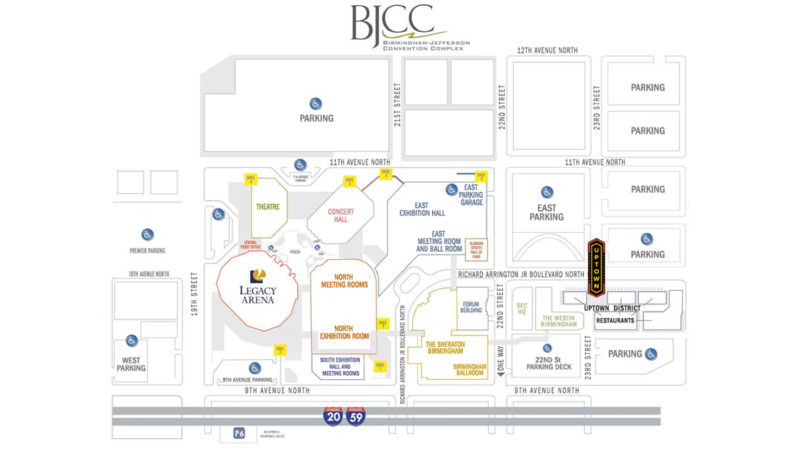 Travelers to and from the BJCC will need to use new routes during construction. The BJCC looks forward to the completion of the new bridges, and the safer road conditions that everyone in our community will enjoy. During construction, we will provide detailed information about new routes to our ticket-holders and the public. The BJCC will remain open for the duration of the construction project, and will continue to host a wide range of exciting events throughout 2019. By planning ahead and using our Animated Maps (see below) with detailed directions, our guests will continue to enjoy events at the BJCC with minimal interruptions. Our Animated Maps highlight routes that consistently will be open throughout January 2019.